The term “flipping” has become incredibly common in real estate vernacular. The idea of buying a property, fixing it up, and selling it for more than the buyer paid for it is just the many ways that people use investment properties to make a living. 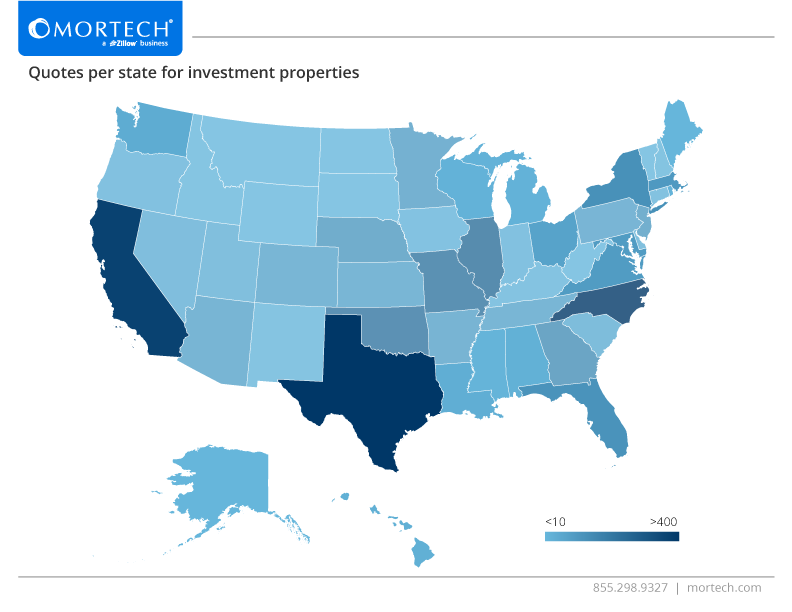 So, we pulled some data from Marksman to see which areas in the country have a higher volume of investment properties, whether it’s due to renting or flipping. Looking at the map above, the areas with the highest investment property quotes make a lot of sense. Some are vacation spots, like North Carolina and Missouri, which likely see a large amount of people coming in and renting for short periods on a beach or lake. Others, like California and New York, make sense in the idea that the cost of housing is higher in those areas, which means more people are likely to rent a property rather than buy one up front right away. As for areas with lower amounts of quotes, there are reasonable inferences we can draw as well. The “western” Midwest, such as Montana, Wyoming, Idaho, etc. all have relatively low investment property quotes, likely due to the fact that populations in these areas are more sparse, and most properties here are bought for the owner instead of for fixing up rent out. Parts of the East Coast, such as Vermont and New Hampshire, similarly have fewer quotes, possibly due to these same circumstances. No matter the reason for a buyer wanting investment property, they’re going to want the best possible rate when considering taking out a loan. Because of this, it’s important that lenders can put out the most accurate rates as quickly as possible, so that they can reach each of these borrowers and nurture those potential leads before they’re lost. Mortech makes all of this possible with Marksman, so find out how you can push accurate rates out to more borrowers by scheduling a free, consultative demo with us today.